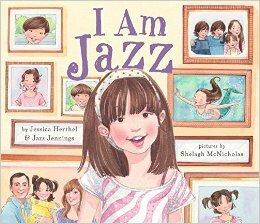 In an attempt to educate and defend against discrimination of transgendered people, this past week educators, parents, and youth advocates held over 50 separate nation-wide public readings of the children’s book I Am Jazz, a book that is no stranger to controversy. The popular children’s book, which is based on 12-year-old Jazz Jennings’ real-life transition from a boy to a girl, has been challenged and banned across the nation since its initial publication. Most recently, it was the target of a lawsuit threat in Mount Horeb, Wisconsin — a threat the CBLDF joined a coalition to fight. It was also included in the American Library Association’s 2015 Ten Most Challenged Books list. Despite the challenges that the book and Jazz Jennings herself have faced, communities have stood in support of the book. This most recent effort, coordinated by the Human Rights Campaign (HRC) Foundation, is a further successful example of how the title can be used to help educate people and build “supportive spaces” for transgender students and community members. Sponsored by the HRC Foundation’s Welcoming School’s program, the National Education Association, and the National Coalition Against Censorship (one of CBLDF’s frequent partners in the fight for free speech), the nation-wide effort involved over 3,500 people and has inspired a trend for hopefully more reading events to be held in the future. Today, in dozens of communities across the country, people are standing up and supporting the full humanity of transgender children and youth by lifting up the values of respect, compassion and love. They know that there never has been a more important time to step up and speak up, helping all of our children thrive, and become better human beings for a better tomorrow. If you are a librarian or educator looking to coordinate a reading of I Am Jazz, visit the HRC Foundation’s Community Readings page. Below are also some quick links to some of CBLDF’s coverage of the Mount Horeb challenges to title.